Challenged by a former educator, the Speaker of the House got everything wrong—factually, and morally. Paul Ryan and Sister Erica Jordan at the CNN Town Hall in Racine, Wisconsin, on August 21, 2017. House Speaker Paul Ryan does not hold traditional town-hall meetings. The Wisconsin Republican is so frightened by his constituents that he now opts for restricted events where the questioners and the questions are screened. But the frustration with Ryan has grown so great that the restrictions are no longer sufficient to shield this political careerist from scrutiny. 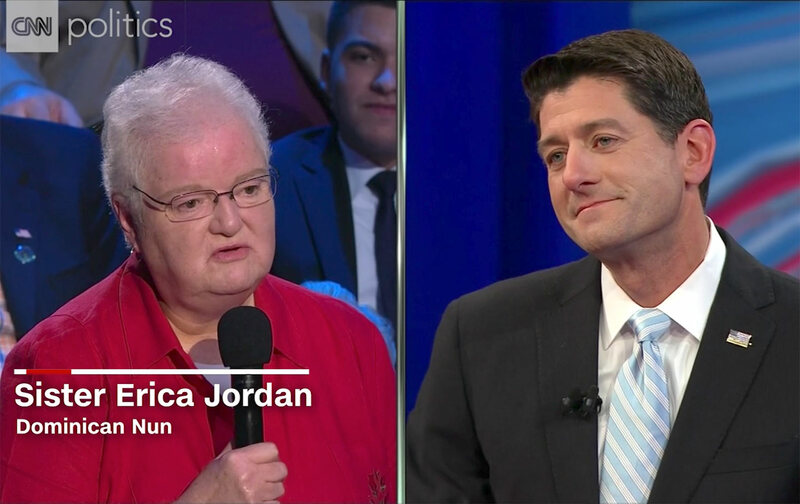 When Ryan participated in a “CNN Town Hall” last week, the questioners from Racine and other communities in his district asked tough questions, as did moderator Jake Tapper. One line of questioning was particularly devastating—as it revealed Ryan’s startling ignorance regarding not just poverty but the antipoverty programs he seeks to diminish and dismantle. Good evening, Mr. Speaker. I know that you’re Catholic, as am I, and it seems to me that most of the Republicans in the Congress are not willing to stand with the poor and working class as evidenced in the recent debates about health care and the anticipated tax reform. So I’d like to ask you how you see yourself upholding the church’s social teaching that has the idea that God is always on the side of the poor and dispossessed, as should we be. Ryan answered with a spew of right-wing talking points about how historic antipoverty programs have supposedly failed. The status quo isn’t working, Sister, and what I think we need to do is change our approach on fighting poverty instead of measuring success based on how much money we spend or how many programs we create or how many people are on those programs, you know, measuring on inputs. Let’s measure success in poverty on outcomes. Is it working? Are people getting out of poverty? No one except Paul Ryan thinks the war on poverty started 32 years ago. 2017 minus 32 is 1985. That’s the middle of Ronald Reagan’s presidency. The official poverty rate is currently in the middle of that range, around 13.5 percent. So, in addition to getting the timeline wrong, Ryan got the measures of results wrong. Poverty dropped dramatically when antipoverty programs were initiated in the mid-1960s and it has not returned to the levels that existed before the launch of the war on poverty. Should poverty rates be lower? Absolutely. But it is not war-on-poverty programs that keep the rates from dropping. It is the failure to maintain the commitment to “curing” and preventing poverty that LBJ and the Democratic congresses of the late 1960s evidenced. Republican presidents from Richard Nixon to Ronald Reagan to the Bushes dialed down the fight against poverty—and the Democratic presidents who followed LBJ were too cautious about dialing it up. Paul Ryan, with his proposals to gut the Affordable Care Act, and with his long history of looking for ways to undermine Social Security, Medicare, Medicaid, and nutrition programs, has got the calculus exactly wrong. Despite the evidence that federal, state, and local action to address poverty works, he wants to weaken those programs. Ryan missteps were noted by the crowd in Racine. They booed him frequently as he attempted to answer the sister’s questions with economic fantasies. For her part, Sister Erica Jordan was unimpressed by the speaker. The nun was having none of Paul Ryan’s preachments. “It’s unconscionable that our elected officials feel free to do what they’re doing right now taking away health care, threatening Social Security and Medicare,” the sister explained to Commonweal magazine in a thoughtful conversation with John Gehring, the author of The Francis Effect: A Radical Pope’s Challenge to the American Catholic Church (Rowman & Littlefield, 2015). It is just wrong. Speaker Ryan is a leader and he seems to be totally complicit in this way of thinking. I want him to really think about my question. I’ve been so distressed by this Congress and going through what we did during the health-care debate. There is such a disregard for the common good and the poor. It makes me angry. I do believe he is a man of faith, but I think he is misguided. “Misguided” is a very polite word for Paul Ryan. But the sister can be polite. She won her debate with the Speaker of the House—on moral and factual grounds.